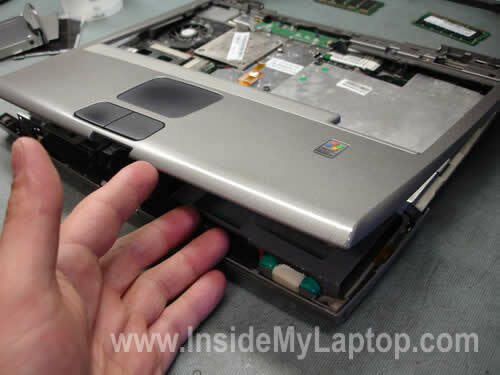 In this guide I explain how to disassemble a Dell Latitude D500 laptop. Also, you’ll see how to access and replace all other internal parts. I had two different problems with the computer. 1. The power jack was damaged. I could have just resoldered the jack but the second problem was more serious. 2. The motherboard couldn’t charge a known good battery. Apparently it had a problem with the battery charging circuit. So I decided to replace the motherboard. Instead of buying just a single motherboard, I bough the whole motherboard assembly (you can see it on the first picture) which includes the board itself, mounting frame, cooling fan, speakers, hard drive bracket, PC card slot, modem and power button board. OK, let’s start taking it apart. Before you start, turn off the computer, unplug the AC adapter and remove the battery. 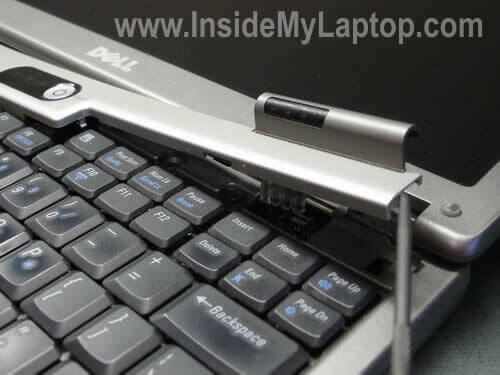 Lift up one side of the keyboard cover with a small flat head screwdriver. Remove the cover. Remove two screws securing the motherboard. 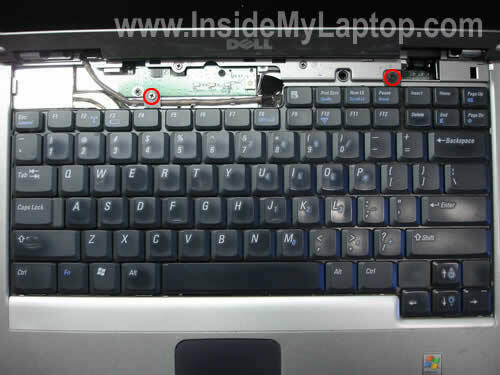 Disconnect the keyboard cable from the motherboard. 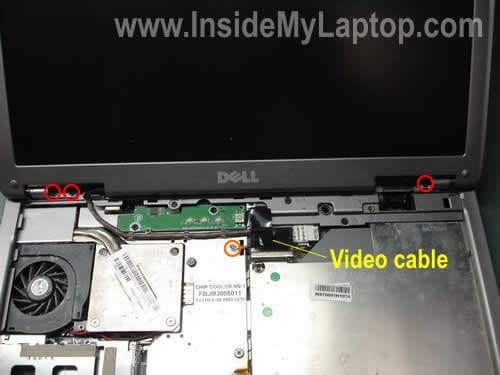 Disconnect the video cable connector from the motherboard. Remove three screws securing the display hinges. Carefully remove the display assembly. 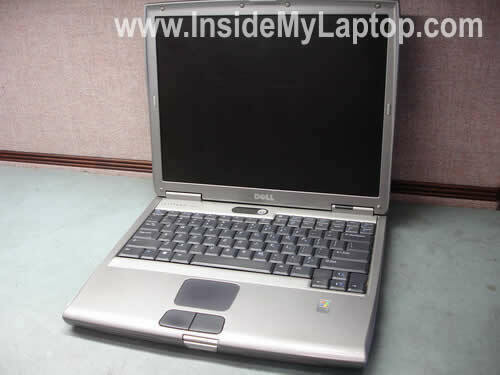 In one of the previous posts I explain how to remove the LCD screen from a similar Dell model. 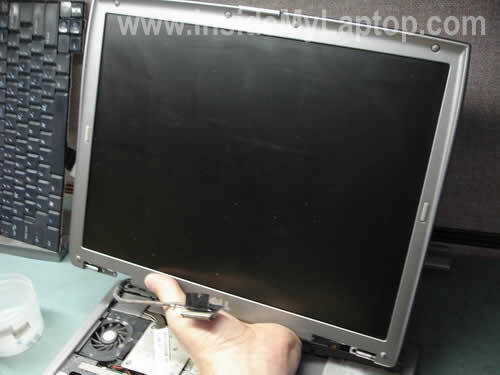 It’s not necessary to separate the display panel from the base in order to remove the screen. 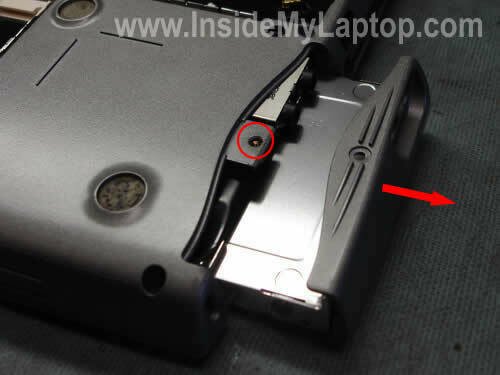 Remove one screw securing the CD/DVD drive and pull the drive out. 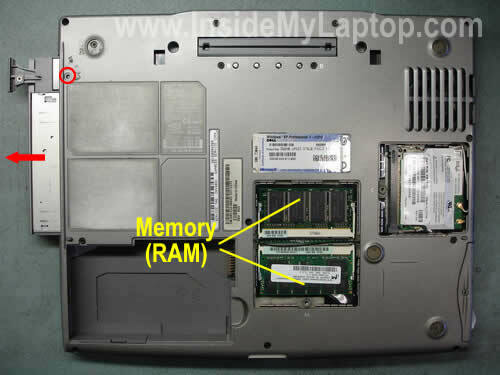 Remove both memory (RAM) modules. Unsnap both antenna cables from the connectors on the wireless card and remove the card the same way you remove memory modules – spread latches on both sides of the card and when the card pops up, pull it from the slot by the edges. Remove one screw securing the hard drive assembly and pull it out. Remove three screws securing the top cover assembly. Disconnect the touch pad cable from the motherboard. 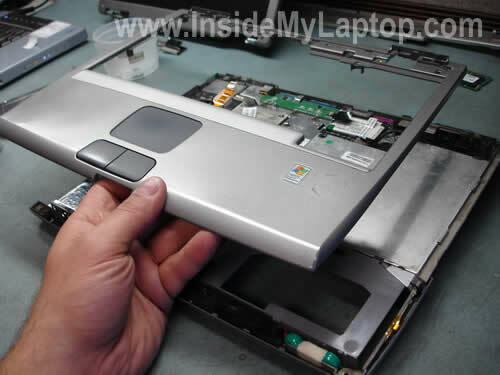 Start lifting up the top cover assembly as it shown on the picture. Remove two screws from the motherboard assembly. 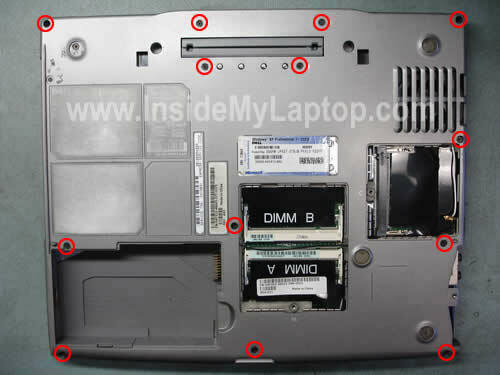 Start removing the motherboard assembly as it shown on the picture below. I noticed that it’s easier to remove the motherboard assembly if you remove the RTC (CMOS) battery cover first. It’s located in the battery bay. The motherboard assembly has been removed. Loosen four screws securing the CPU heat sink. Remove the heat sink. In my laptop the heat sink was clogged with dust and needed a good cleaning. Now you can access the CPU (processor). Unlock the CPU socket by turning the screw-lock into “Open” position. Carefully lift up the CPU and install it into the socket on the new motherboard. 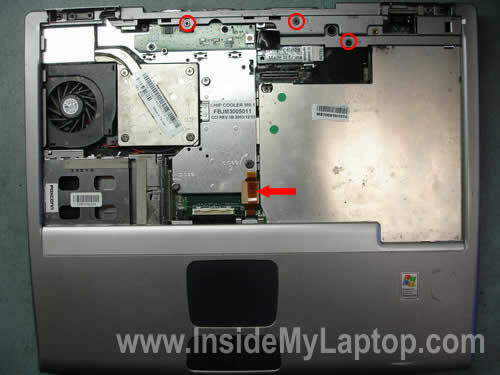 Do not forget to lock the socket after the CPU is installed or your laptop will not start. You can search for a new motherboard by the part number from the old motherboard. 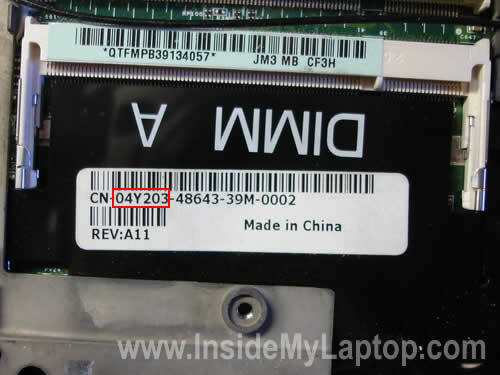 The part number is located on a sticker glued in the RAM slot area. The second set of number in a long string is the part number. 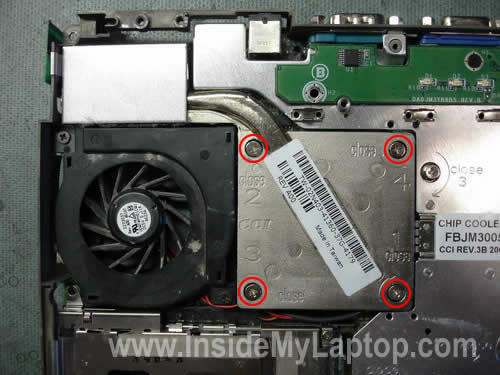 In the next post I will explain how to remove the motherboard from the mounting frame and prepare for the power jack repair. You are a golden god! Thank you very much for your generous donation. 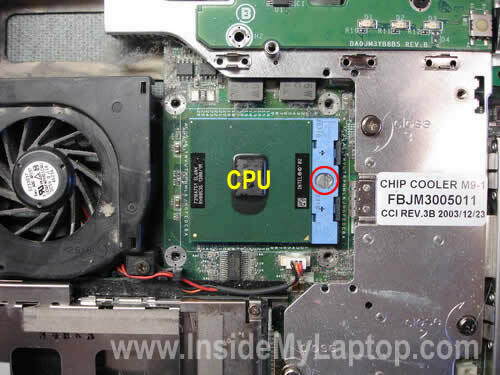 I have sony vaio pcg-61212w, after cleaning cooling Fan, MY laptop is not booting, screen is not glowing , on pressing power button fan runs but no symbol of hardisk light glows . It runs for few seconds and there after automatically shutdowns.